A few of the returning artists to the Festival each year are…..
Knoxville Symphony Orchestra Formally established in 1935, the Knoxville Symphony Orchestra began a period of significant growth in 1947 when David Van Vactor assumed dual roles as Chairman of the University of Tennessee’s Department of Fine Arts and the KSO’s Music Director. For the next 26 years, Van Vactor attracted many outstanding musicians to the community and nurtured the Orchestra’s burgeoning reputation for excellence. Today the Knoxville Symphony Orchestra is recognized as one of the finest regional orchestras in the United States. Yuri Vodovoz, Violinist Violinist, Yuri Vodovoz, native of Odessa has concertized extensively throughout the United States, Europe, Israel and South America. His debuts at the Kennedy Center in Washington and at the Merkin Hall in New York were met with critical acclaim. His playing has been described as “breathtaking” (the Washington Post), “finespun lyricism” and “high-powered technique” (The New York Times). Mr. Vodovoz is on the faculty of Mannes College of Music and Ameropa Summer Festival in Prague. Assistant Artistic Director, Vladimir Valjarevic, Piano Faculty Mannes College of Music Born in Bosnia and Herzegovina, pianist Vladimir Valjarevic came to New York City on a scholarship from the Mannes College of Music, where he earned Bachelor’s and Master’s degrees as a recipient of the Marian Marcus Wahl Performance Award. His principal teachers were Pavlina Dokovska and Vladimir Feltsman. Vladimir Valjarevic has performed in the United States and Europe. He teaches piano at Mannes Preparatory and Extension divisions. Currently, he is a Doctoral Candidate at Rutgers University where he receives Saldarini and Frazier-Durham Awards and studies with Susan Starr. Robert Taylor, Violin Founder and director of the St. Cecilia Orchestra and the Camerata Virtuosi New York, Mr. Taylor began writing poetry and lyrics around the same time he picked up the violin at age eight. His love of music, languages, literature, and birds has led him to a lifetime of study and travel. A graduate of Holland’s Royal Conservatory, Union College, the University of Bonn, and Princeton University, he has taught foreign languages and ornithology in New York, English and music in China, served as music critic to the Albany Times Union, worked as a freelance musician and writer in Manhattan, a translator in Europe and Asia, and has lectured extensively on opera, literature, and art history. As a lyricist and librettist, Mr. Taylor has written several new musicals, including “Ace” (Repertory Theatre of St Louis, Cincinnati Playhouse in the Park, Old Globe Theatre San Diego, Signature Theatre of Washington DC), “Journey to the West” (New York Music Theatre Festival), and “Dispatches from the Frontlines of Parenting” (Ensemble Theatre of Cincinnati, Cincy Fringe). Other current musical projects include “The Sandman” based on the writings of E. T. A. Hoffmann (Signature Theatre of Washington DC commission), “The Debt to Pleasure” (Adirondack Theatre Festival, Water Tower Theatre Dallas commission), and a musical version of Shakespeare’s “The Tempest” set in post Katrina New Orleans. A member of the Dramatist’s Guild, Mr Taylor is represented by CAA (Creative Artists Agency). Kate Dillingham, Cello Kate Dillingham enjoys an active career in the United States and abroad. She has performed as a soloist with The St. Petersburg Philharmonic, The Moscow Symphony Orchestra, The Salzburg Chamber Philharmonic Orchestra, and the Moscow Chamber Orchestra. She has appeared numerous times at Carnegie Hall, The Metropolitan Museum of Art, Lincoln Center, Bargemusic, and Symphony Space in New York. She has performed at the Kimmel Center in Philadelphia, PA, and has been presented twice at the United States Supreme Court in Washington, DC. Kim Foster, Violin Violist Kimberly Foster Wallace represents a new definition of classical musician in the 21st century through her creation of a portfolio career. As musician and educator, she stresses creative career building that combines performance and entrepreneurial skills, and promotes this broad definition of career development through her own example. She is a strong advocate of rarely performed solo and chamber works featuring the viola, and strives to broaden the concert repertoire of the viola as a solo instrument. As entrepreneur, she has started her own businesses including a successful private teaching studio in Monmouth County, New Jersey, has organized and promoted her own recitals throughout New York City, and is currently developing a program to teach entrepreneurial skills to college music students. Festival of the Arts … Thanks to our Sponsors & Patrons! Since the inception of the Festival of the Arts, the generosity of many donors has made it possible to provide this exceptional cultural treasure to the College and the community. The mission of Southwest Virginia Community College “provides quality educational and cultural enrichment opportunities for lifelong learners, workforce and community”. The Festival of the Arts is just one excellent way in which the College can fulfill this part of SWCC’S Mission. Without our generous donors, we would be unable to offer this opportunity to both the College and the Community. Listed below are sponsors of the Festival of the Arts 2019. This list is updated annually; if you should see an error in this listing, please contact us for correction. Pavlina Dokovska is pianist-in-residence at Southwest Virginia Community College for the annual Festival of the Arts. She serves as Artistic Director for the Festival of the Arts and conducts master classes for approximately 30 area piano students with their teachers each year. 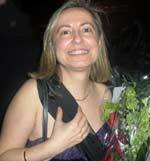 Ms. Dokovska is a member of the prestigious Mannes School of Music in New York and is an official Steinway Artist. An award winning pianist, she is a First Prize winner of France’s Claude Debussy International Competition and Italy’s International Piano Competition of Senigallia. She maintains a busy performing schedule, playing such venues as Spoleto Festival in Italy, the Mai Musical in Bordeaux, Europe, the Far East, and the USA. Ms. Dokovska has presented lectures and master classes at the World Piano Pedagogy Conference in Law Vegas, NV, served as a faculty member of the International Keyboard Institute at Mannes, and Piano Summer Festival at the State University of New York in New Paltz. She has given Master Classes at the Piano Festival at Seoul National University in Korea and has been a regular guest teacher at BIMFA – Beijing International Music Festival and Academy, in China.